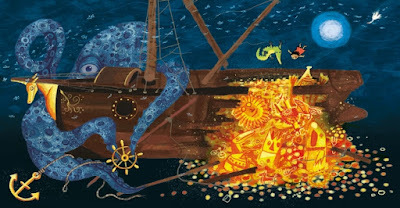 Anna and Crocodile are on the hunt for gold. But finding gold isn’t easy. Oh no! 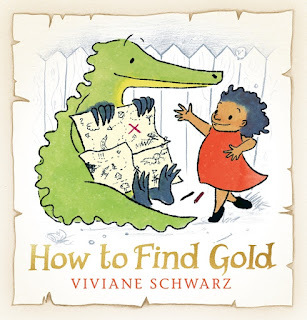 It’s dangerous and difficult and requires planning... We went behind the scenes with author and illustrator Viviane Schwarz to discover how the idea for How to Find Gold came about. Some years ago, I was asked to write a story for charity. The only rule was that it had to have exactly 366 words. At the time I was inventing unlikely instructions, thinking that I might eventually put together something called “The Young Adventurer’s Handbook”. I had collected two so far, one for finding gold and one to go to the moon, and that wasn’t going to make a book, so I decided to donate one of them. I rewrote the instructions to fit the word count and it was printed next to one by Raymond Briggs (about someone getting cross about trying to write a 366-word story). Some time later the rights reverted to me. I had forgotten about it, and reading it again I was amazed how peculiar it was. I let them talk some more, and filled the sketchbook, and filled another one. 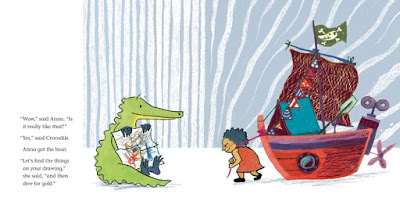 The crocodile started talking, and it turned out that it knew everything I had written down earlier in my story about How to Find Gold. But it wouldn’t ever say anything else. The girl became more confident the more I let her talk in my drawings. She started to look less like me and more like another small girl I met some time ago who liked my cat books and gave me a little book that she had made about a journey to a magical land. The crocodile remained taciturn. I made it from a toy into a real one. It enjoyed that, but still wouldn’t express any opinions or form any notions. I wrote and rewrote and talked about the story with my best friend as we walked along the Thames, looking for reeds and feathers that I could turn into drawing implements. “I just don’t know what that crocodile is like,” I said. We met a wild horse and I found a very small bit of its mane. It made a really nice brush, and I painted a crocodile that looked a lot like my friend. 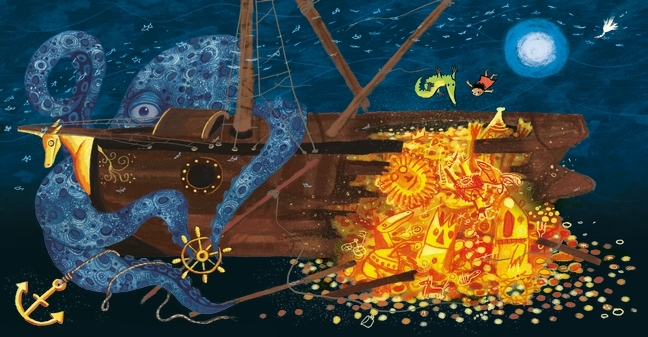 “Finding Gold would be dangerous and difficult,” said the crocodile. The home I drew for Anna and Crocodile is Northolt, but don’t worry if you don’t recognise it. There’s a duck following them most of the way from the canal to the deep sea. I guess they could be living anywhere that has ducks and pedestrian underpasses and pollarded trees. Even some of the exotic trees they find on a desert island later are pollarded, like the one outside my window. I missed talking with them in my sketchbooks, and started writing letters about their further adventures. There is a small stack of those by now, and several notebooks about their journey to the moon. I hope you’ll get to read them some time. Be one of the first to read How to Find Gold and pick up a copy in your local bookshop. Join in the fun and download our free activity sheet here.